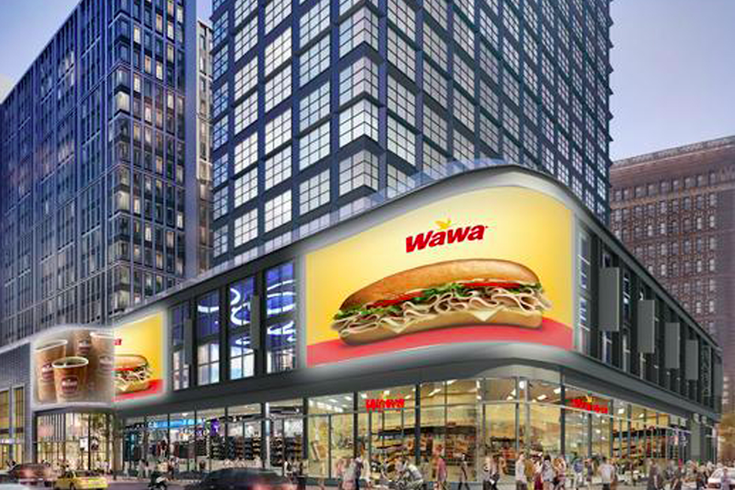 The rendering of a Wawa location that will occupy the bottom floor of a mixed-use project at 12th and Market streets. Ask any Philadelphian for the best place to shop in Center City and they'll probably tell you either Rittenhouse or South Street, both of which offer a mix of independent shops, big brands and specialty stores. With the old Gallery reduced to a sad skeleton, would anyone still say Market East is a killer place to go for much more than some underrated discount shopping? However, according to a new report from JLL, a professional services firm that specializes in real estate and investment management, Philadelphia's Market East is the most affordable prime urban retail corridor in the United States. And its star is only getting brighter. Once home to vacant lots and failed fortress malls, Market East is now attracting large-format retailers looking to tap into the swelling millennial and empty-nester population. Market East’s average asking prime retail rent is $50 p.s.f., with annual rent growth of 25 percent. There's little mystery behind the buzz around the area. The combination of PREIT/Macerich's upcoming Fashion Outlets of Philadelphia and National Real Estate Development's massive East Market project is poised to transform this section of Center City into a residential and commercial powerhouse over the next five to 10 years. In an accompanying report, JLL notes that Market East benefits from its position between two of Philadelphia's biggest visitor nodes: the historical sites of Independence Mall and the Pennsylvania Convention Center, where Reading Terminal Market offers a deluxe food court experience for shoppers. The boom in Center City's population since the turn of the century also makes the area a natural choice for retail expansion. "With nearly one million square feet of new or renovated retail space delivering between 2017 and 2019, leasing activity is achieving a pace not seen in decades," the report said. What really separates Market East from other destinations is its planned mix of brands, restaurants, entertainment and lifestyle venues that define a growing shift from "high streets" to urban retail corridors. Here are JLL's top 10 retail corridors in the United States. 9. Metro Center, Washington, D.C.